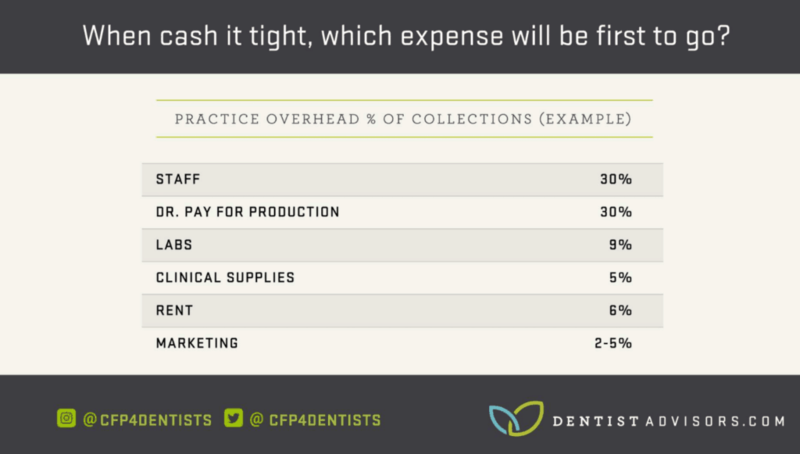 In working with practices across the country, we often get asked by dentists this question: “How much should I be spending on my dental marketing?” We have spent the time to learn about the practice, identified the goals the marketing intends to accomplish and we close with our own question. “What is your comfortable dental marketing budget?” We realize that industry standards play an important role in determining what’s “normal” and we also take into account what is necessary to achieve the goals you are setting forth. Reese is the cohost of the Dentist Money show. In presentation material at the 2018 Dental Digital Marketing Conference, he has estimated that a typical dental practice spends between 2-5% of their annual collections on marketing. In his podcast “Why Your Practice is Like a Pencil” Reese says, “In my opinion, a lot of people don’t spend enough on marketing.” Highlighting that when deciding what to invest in, you should prioritize the things that increase collections. Offering a different perspective, Nathan Williams the founder of Practice Financial Group believes that “a blind, flat, universal percentage of collections doesn’t work and isn’t practical.” Instead, Williams argues that the marketing dollars spent should be whatever is necessary to keep the doctor as busy as he/she wants to be. He offers this advice to dentists: “The first and most important marketing any doctor will ever do, with the highest return on investment, guaranteed, is to deliver an exceptional patient experience to each and every patient who walks through their door.” Providing that experience may not be “marketing” per se, but you impact it with the team you select, the equipment you invest in, and even the CE you decide to take. Identify what you want your dental marketing to accomplish. If you want to go from 5 new patients a month to 40, chances are you’re not going to get there on a $500/month budget. If your goals are aggressive, then your budget should match that intention. This is two-fold. $1000 of dental marketing in Sheboygan, WI is going to go a heck of a lot farther than $1000 of dental marketing in Houston, TX. The bigger the population the more competitors you likely face. A dental practice in Sheboygan could spend 2% annually and experience phenomenal growth, but a practice in Houston may have to spend 5% just to maintain. The more competition there is in your area, the more you should expect to spend. Track where your new patients are coming from. The best way to know where to put the marketing budget is to see what’s working for you already and double down. You do not have to do all the marketing things, but you should make sure you know which of those things are working really well. Use tracking numbers when you invest in new patient driving strategies. Train the team to ask, and enter the data properly. Trust us, the data is your friend! Yes, there are practices out there who have gotten up to full speed and benefit from the patient referral engine driving their ongoing growth. There are even practices who <gasp> have yet to implement a website because business is so good. These rare gems are just that, rare. When word-of-mouth alone can’t keep you in the black, you must find the dental marketing strategies that will – and have a budget to support them. Be results-oriented. Be realistic. Be ready for trial-and-error. There is no one-size fits all dental marketing plan for your practice’s success. While we look to experts and averages to be our guide, your dental practice’s plan is uniquely yours. So if you are seeking out a dental marketing agency, know you have options. In fact, we have a quiz for that. While evaluating dental marketing agencies, our advice would be to tell them your goals first, not your budget. They should be able to give you an idea of what it will take to get there. Even if there is some initial sticker-shock associated with the price, any dental marketing strategy that can deliver you a healthy return on investment is worth it! It’s just math.